Every school, college, university or any academic institution will require to use a school management software in order to store data pertaining to school management, administration records, students’ related information, teachers work, etc. Generally, a school management software will have a user interface that has a login access for school administrators, head of school or principal, teachers, students and parents. These are for retrieving relevant information for each group, for instance, teachers will want to store and retrieve student information such as assignments, grades, attendance, etc. Similarly, student will use the user interface to submit homework/assignment, communicate with teachers, access grades on assignments, timetable, etc. Parents will use their parent login to view monitor academic progress and performance of their children, grades or report cards, communication from teachers, queries, etc. However, a school management software should be robust in terms of security, feasibility, usability and cost. The software should have a user-interface that are easy to use by parents, teachers, students, and school administrators with minimal of training or instructions. Besides, the software should be secure enough with built in firewalls to prevent hacking. The software should also be flexible enough to accommodate updates or configure to meet the specific needs of the school. Further, cost of having a school management software should be affordable including both the subscription and maintenance. Having a school management software on cloud is a viable option because of its usability, flexibility, security, adaptability and cost effectiveness. One of the advantages of having a school management on cloud is that it can be easily deployed with minimum efforts to migrate data from one platform to another. It will be less expensive than having a school management software on a school owned server. Since the software and school database will be on cloud it will be easy to store, access and retrieve data. Updates and configuration to software can be more flexible on cloud when compared to storing on a local server. Another advantage of having a school management software on cloud is the capacity to store massive data as well as the ease of retrieving them. Further, data security on cloud is reliable and its robustness depends on the kind of services offered. For instance, many school management software on cloud is free whereas customization and upgradation will be available for a price. 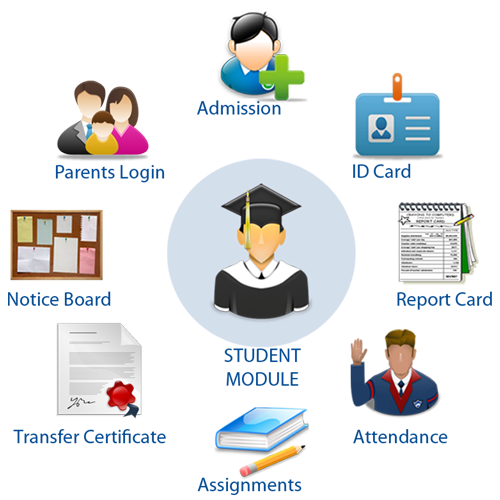 Most of the cloud-based solutions for school management system will have powerful interfaces that are user friendly suitable for both Web and Mobile Applications. Though, many school management software have a standard version, they will have features that can help in customizing the product according to the school requirements. Hence many cloud based solution companies offer variety of solutions for school management software that can be customized as per the school or educational institution needs. However, when selecting a school management system offered by a vendor, certain factors have to be considered to ensure a right choice. As there are lot of vendors in the market for school management software, it is very important that a right choice is made to ensure credibility. Selecting a more complex software can only complicate tasks rather than purchasing a single solution software that is more feasible and cost effective. So what are the measures or factors one need to take into consideration when choosing a school management software? Price and features are usually considered as important factors to purchase school management software. Schools may consider features like attendance, home and assignments, grade reports, student record keeping, time-table and resource management, library management, transportation details, communication management, course management, new registrants, fees details, query management, staff management and school inventory management. Similarly, schools may also consider the cost when purchasing school management software. For instance, many cloud based solutions on cloud are free with pricing plans for upgradation. But some vendors provide pricing plans to make it simple like monthly plans or annual plans with discounts which eliminates hidden costs and offer customization with unlimited tech support. A few vendors may also offer a free one month trial so schools take the advantage of exploring options and test if the software fits their needs. Apart from price and features what are the additional factors that schools should consider when making decisions to buy a school management software. One of the essential aspects of cloud based solution for school management software is data security as massive data will be stored on the cloud. Since the software is cloud-based and is not purchased but only subscribed, data security offered by cloud should be more advanced. Data security has to be ensured where data is encrypted and is fully protected with security layers so that it cannot be accessed by unauthorized personnel. Besides, data stored on cloud should have real-time data so that they can be accessible for anywhere and anytime and from any device like web browser, mobile, tablet, etc. Real-time data is effective way of using data in schools as it is important for certain areas of decision making like changes in student time-table, replacement of teachers or changes in exam date schedules, etc. An additional beneficial feature of school management software is the reporting architecture with the ability to run analytical reports that are essential for management decision-making and custom fields to perform custom reports for any kind of reporting requirements. A school management software vendor not only provides tech support for customization and upgradation but also should provide regular data backup or provide options for schools to make data backup. Further, they also provide the necessary training through video presentations, or webinar tutorials. Choosing the right vendor to purchase a school management software is crucial as only a credible vendor will provide on-time support when there is an issue. Vendors of school management software provide professional support through phone, email, webinar, etc. Hence when making a decision to purchase a school management software it is critical to choose the right vendor that suits the business needs so that the investment, efforts and time for implementing a school management software is worth the choice.